From turbine engines to sensors, additive manufacturing is driving innovations across the spectrum of industrial automation. Curious as to which markets are hot? Get our Top 10 Guide to Industrial Additive Manufacturing Applications. Leading industry authorities have declared Additive Manufacturing (AM), aka 3D printing, the first manufacturing “revolution” of the 21st century. Unlike subtractive manufacturing methods that start with a solid block of material and then cut away the excess to create a finished part, additive manufacturing builds up a part (or features onto parts) layer by layer from geometry described in a 3D design model. These advantages are driving interest in additive manufacturing technology for applications throughout the product lifecycle, from new product development to volume manufacturing to product repair. 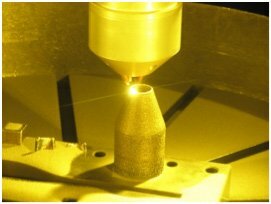 Leading authorities such as Wohlers Associates Inc., The Economist, and MIT Technology Review suggest additive manufacturing is a breakthrough technology that represents the third industrial revolution. It is seen as a transformative advancement because it enables distributed manufacturing and the production of parts on demand while also reducing cost, energy consumption and carbon footprint. With additive manufacturing complex parts can be built more easily and cost-effectively with less waste and significant performance gains. Ultimately, additive manufacturing empowers the production of things not even imagined yet. Additive manufacturing technology first emerged in the 1980s and was used to print plastic objects with a technique known as Stereolithography (SLA). In SLA an ultraviolet light beam is used to selectively cure a photosensitive polymer to build up a part layer by layer. Later other processes for printing plastic objects emerged such as Fused Deposition Modeling (FDM). In FDM a thermoplastic filament is extruded from a nozzle and heated to build up an object layer by layer.Laser-based additive manufacturing is another technique used to print metallic objects. The two most commonly known methods available for commercial use today are “Powder Bed Fusion” (PBF) and Powder Fed “Directed Energy Deposition” (DED) systems. 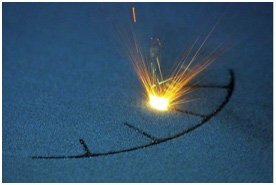 PBF systems use a laser to selectively melt a bed of metallic powder layer by layer to build up the physical part. After the first layer is spread and sintered, the bed is filled again with a second layer of powder and selectively sintered. This process is repeated until the part is fully formed. The end result is buried in the powder cake and is not visible until the excess powder is removed (see figure 1). In Powder Fed DED systems metallic powder is continuously blown through nozzles directed at the focal point of a high powered laser. The resultant molten pool of metal is then moved using a motion control system and the part is built up in free space. The entire process is visible as the part is grown layer by layer (see figure 2). Powder Fed DED systems, such as LENS offered by Optomec, also can be used to add material to an existing metal part for example to repair it, add an engineered feature or wear resistant coating, and for hybrid manufacturing applications. In 2014 a number of equipment suppliers introduced hybrid CNC machines where additive and subtractive processes could coexist on the same machine tool (see figure 3). The synergy of these two technologies integrated in one machine tool platform offers a number of advantages to the metal working industry including lower deployment cost, reduced learning time and risk, and increased manufacturing flexibility. Today additive manufacturing for printed electronics is used for mass production of consumer electronics devices. 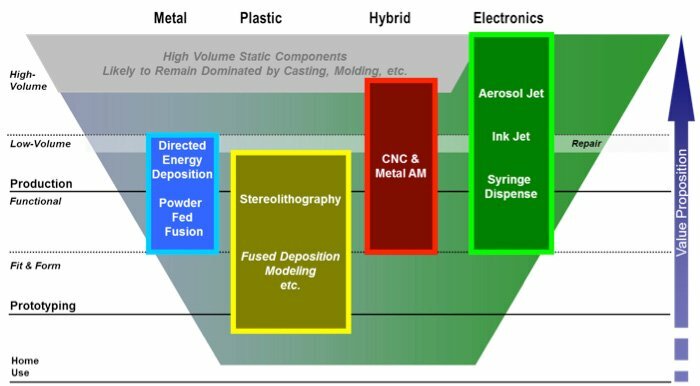 This variety of additive manufacturing methods and where they are applied is summarized on figure 5 below. Further proof of the rising importance of additive manufacturing is America Makes. America Makes is a public-private venture established by the United States Government to act as the national accelerator for additive manufacturing and 3D printing. Optomec is a Platinum member of America Makes and works in collaboration with other member organizations from industry, academia, government and non-government agencies to increase America’s global manufacturing competitiveness by innovating and accelerating Additive Manufacturing. Other countries have similar initiatives including Belgium, China, England, Germany, Japan, and Singapore. Additive Manufacturing uses digital design data to build up an object by depositing material layer-by-layer. The process begins with digital data that is created either on a Computer Aided Design (CAD) system or from 3D scanning an existing part. The digital data describes the geometric shape of the desired part. Then a software program is used to slice the design data into layers from which a tool path is produced that provides motion coordinates to the printer to produce the object. To perform the printing, the 3D printer reads the digital data to form successive layers of material to build up the part. Often post printing operations are required to cure or smooth the surface finish of the printed part. Optomec takes an evolutionary approach to help customers realize the benefits of additive manufacturing technology within their production operations today. To Optomec, additive manufacturing means adding value to any object or process. With Optomec, customers can fully print a part “in” 3D and also “print-on™” 3D (or even 2D) parts that were produced by conventional methods. This subtle but important difference enables additive manufacturing technology to co-exist with conventional manufacturing methods where it provides more value. Optomec also embraces an open system approach to 3D printing. 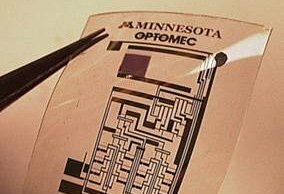 Optomec does not tie its customers to a single materials supplier. Optomec customers can purchase materials directly from multiple suppliers lowering costs and providing a more secure supply chain. 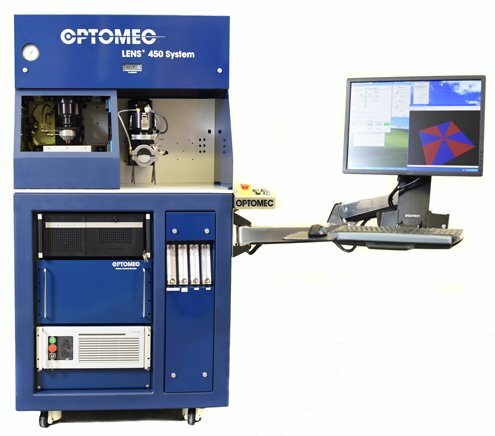 Optomec offers its industry-proven 3D printing technology in a modular form for integration with factory automation systems, robots, and CNC platforms thereby lowering adoption costs and risks. 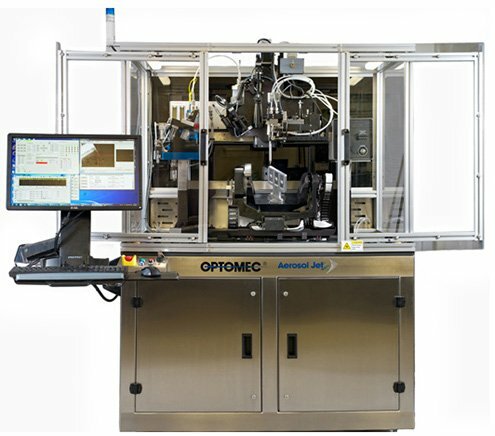 With unique 3D printing technology that supports a broad range of functional, production-grade materials and feature sizes Optomec 3D printers are helping companies transform how they conceive, design, build and maintain critical parts and products. Two product lines collectively support metal 3D printing, 3D printed electronics and a hybrid additive manufacturing approach. The material science behind additive manufacturing is why this process is so transformative and revolutionary.Additive manufacturing technology from Optomec is capable of processing a wide variety of functional materials including structural and conductive metals, ceramics, conductive adhesives, dielectrics, semiconductor, biological and many other materials used to fabricate aerospace, medical, and consumer electronic devices. This unique technology also enables materials to be selectively printed only where needed to add structural or functional features or to improve end-product performance. The printing process can be controlled to produce features with desired mechanical or electrical properties. 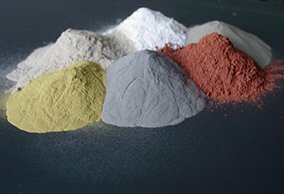 Materials can even be blended during printing to create new alloys or gradient structures for improved product performance. 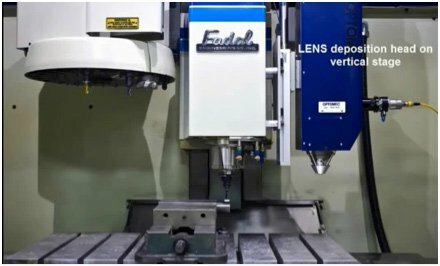 LENS systems use energy from a high-power Fiber Laser to build up structures one layer at a time directly from commercially available metal powders, alloys, ceramics or composites. 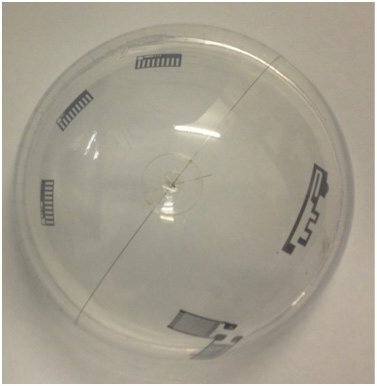 Aerosol Jet systems have the unique ability to directly print a wide range of electronic and biological materials (including commercially available materials and custom formulations) onto almost any substrate.